In a matter of days, you’ll hear the collective sighs of mothers around the country saying goodbye to their college bound students. You may also hear a few whoops and hollers from the students as their parents drive away! This is a major milestone for parents and students. As parents, we are excited for our children and the road ahead, but it also signals the end of an era for us. For students, it means newfound freedom and the beginning of an amazing journey. While most won’t admit it, they probably are a bit anxious about leaving the security of home, as well as free laundry services and clean bathrooms. So imagine combining all of your emotional baggage with plastic bins, luggage, and small appliances. Now add in traffic, minimal parking, August weather, and if you’re lucky two elevators – that is college move-in day! Don’t worry. In the right frame of mind and a little preparation, you’ll get through it just fine. 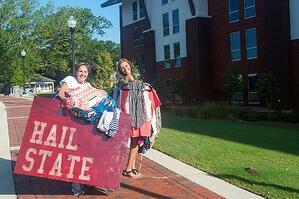 Here are few tips from Residence Hall experts and parents that have survived the freshmen day move in! If your child is like mine and hasn’t looked at any of the literature about move-in day, then enjoy taking charge one last time! 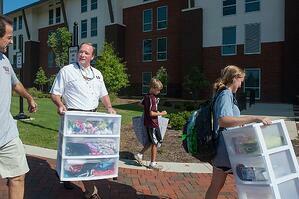 Go to the university’s residence life website where you can find all the details about move-in day. University of Pittsburgh’s “Arrival Survival” details everything from before you leave home to after you’ve moved in. They even have a twitter handle just for the big event. Residence Housing websites provide information about each residence hall, including what basic items come with the room. Some schools provide or rent the mini-fridge and microwave. Note that many rooms use extra long mattresses – meaning your sheets from home may not fit! You can also get measurements to determine if there’s space for additional items like beanbag chairs, extra storage units, etc. You don’t want to waste time and money buying and packing items that may never be used. Once you’ve figured what your student needs, make a list of items they use at home – toiletries, kitchen supplies, laundry, etc. This will give them an idea of what they will need to bring and determine how to store it. Don’t forget miscellaneous things like a garbage can, hangers, and a first aid kit. Shower curtains and tension rods come in handy for additional privacy in suite-style bathrooms. Anne Garraway, a mom with two students at Mississippi State, said to consider purchasing a good mattress pad/foam pad to make the bed more comfortable, as well as a little fan in case roommates don't agree on temperature. Consider waiting a few weeks on items like an iron. “Many times, one student on the floor will have them and they can share with others,” said Noblit. She also said televisions and printers are on the decline, especially with the rise of streaming television sites and more professors accepting assignments via email or other online systems. Most residence halls have student lounges with TVs for public use. Michele White, a mother of two college graduates and a senior at the University of Louisville, advises students to talk to their roommate(s) before they purchase anything. Decide beforehand what common items they will each contribute. “You don't want two refrigerators and two TVs,” said White. Should you buy here or there? However, if you want the full experience, a trip to the university’s local Wal-Mart or Target with everyone else on move-in day can be a fun and memorable event! Another option to is to purchase items at big box stores online or in your home state and then have them delivered to the local store near the university. It’s important to have everything in manageable bins, suitcases, etc. Misc. grocery bags of items are sure to rip, or fall over emptying your nice clean linens on the ground. 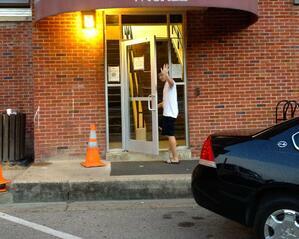 Move-in day is usually staggered by dorms, floors, etc., to ease traffic and parking. When you get there,your student will check in to receive his dorm keys. Once we pulled up to my son’s residence hall, there were at least four volunteers ready to take his belongings straight to his room. The van was unloaded within minutes. His residence hall did not have elevators, so we were extremely appreciative of the help to the third floor! Even if your student’s residence hall does have elevators, expect a wait or use the time to get your cardio by taking the stairs! Once you’re all moved in, schools may have complimentary refreshments. LSU offered banana splits – encouraging parents to “split!” MS State had a “Blues Breakfast” the morning after move-in. For Hymel each goodbye was different. With one, they agreed to just say “see ya soon!” With another, the best farewell was a long hug and a few words of encouragement. Her youngest just gave her a kiss on the cheek and told her he would be fine. “We encourage families to say ‘see you later,’” said Bailey. We want to hear about your move-in day experience. Make sure to send pictures!